About this guide: This guide will show you how to build a very simple circuit that will allow you to power more LEDs from a single channel from a Ghozt Sequencer module can all by itself. This can be useful for builds that have large LED arrays, halos, or high-powered LEDs. This booster will be able to supply up to 2 amps to an LED while converting the output to a positive-side switch. 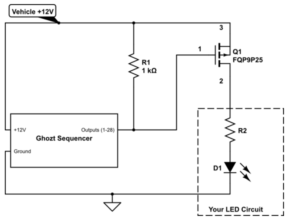 Step 2 – The circuit diagram: Below is a diagram of the circuit you will be building. You can build one of these for each of the channels you want to boost. Each one should be connected to a different sequencer output channel. 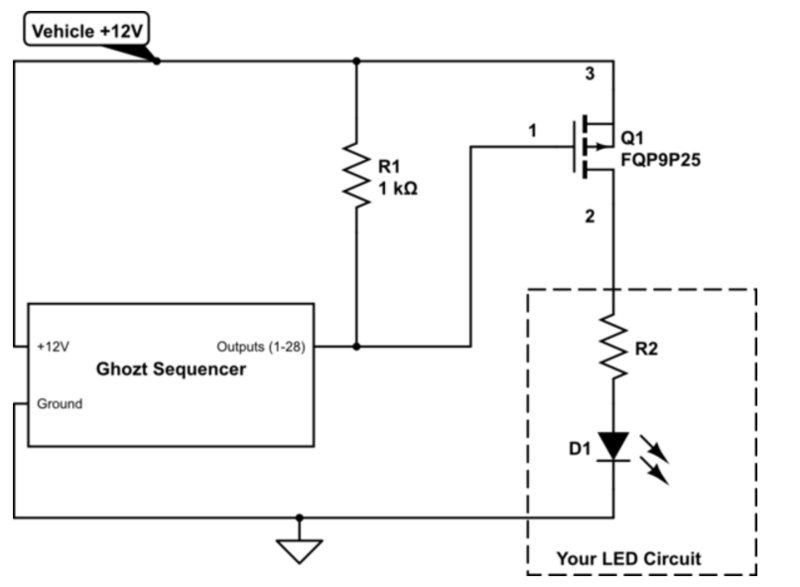 The negative side of the LED circuit should be connected to the same ground as the Ghozt Sequencer. Also, note that you are going to connect the Drain (pin 2) to the positive side of your LED circuit. Finally, although the diagram shows one LED, you are free to design your LED circuit with multiple LEDs as you see fit. Be aware of how much heat will be produced in your assembly and make sure you know how to manage it. With this much power some of the components are going to get warm, including the transistor and the LEDs. Be aware of the overall amount of heat and any hot-spots. Make sure that there is room for air to circulate by convection so that all of the components get the cooling they need. Use zip ties and other wire management techniques to keep wires away from hot components that can melt insulation. Use only fire retardant materials.